When having dinner with a few friends who had just moved to the DC area from California, I asked them how they were acclimating to their new home. “The weather has taken some getting used to,” one friend admitted. The table immediately began diving into the unpredictability of DC, and east-coast, weather. There is nothing like that 72 degree February day to make you feel like you’ve just hopped a plane to a southern latitude in the middle of the winter. Polar vortexes come along in late November and make us feel like we’ve been placed into a snow globe for a few days. Sweaters and base layer clothing comes out...then, it goes back in the drawer. Don’t pack away all of your t-shirts, because once that arctic blast moves along, Caribbean air somehow makes its way back. We have a very unique seasonal fluctuation in the DC area. As far as outdoor activities, you never really know what you’re going to get. In a strange sort of way, that can be really cool. Our options are that much greater to choose from. In this blog, I’ll discuss some family-friendly activities for weather of all types so that the temperature or precipitation type does not deter you from exploring nature with your family but excites you with all the possibilities. First things first: be prepared! The main goal is to always engage children in positive and fun experiences when going outdoors. So, the most important point is to be prepared. Gear is important, and the right gear will make the experience so much better. If your children are small, and you worry about them outgrowing a raincoat, go to Goodwill for a temporary solution. Your child does not need Patagonia’s newest rain prevention technology to stay dry. A good old-fashioned poncho will do the trick in a light rain. The point is, give them what they need to stay comfortable outside. Rain boots and snow boots are vital to the Lowell School outdoor program because they keep the dirt and mud out of the school; they keep the classroom teachers happy; they keep parents who just bought their child new shoes happy; and they keep the child happy too. So, whatever the season, be sure your child is equipped with the necessary clothing. Back when I was the director of the Voyagers’ Outdoor Program, middle school students were outdoors for three hours or more per day for their classes. You can imagine that we had to find many different and creative ways to educate and remain academic in all types of weather.During one weather unit, students learned about observing and identifying cloud types. If they were able to identify all cloud types, they were given a badge and inducted into the Voyagers’ Cloud Appreciation Society. I’ll admit, I did not make this up on my own. I got the idea from author Gavin Pretor-Pinney’s humorous and insightful TED Talk. In his talk, he describes what led him to developing an appreciation for the clouds and his reason for writing The Cloudspotter's Guide: The Science, History, and Culture of Clouds. Many people randomly remember a few cloud types from a science class they once took. There’s just something about the clouds that makes people curious. Though I could write all day about clouds, you’re better off walking out to a nice grassy spot and staring up at the clouds with your child. This is a low-maintenance nature-based activity. Use the real Cloud Appreciation Society resources to get you started. If all goes well and your child likes staring up and studying the clouds, you could always become an official member right on their website. Teaching children about the clouds can be as easy as identifying one or two types, or digging much deeper into weather forecasting based on the current cloud types. Take a look at this great resource from Weather Whiz Kids that can guide you through some forecasting activities. Author and naturalist, Tristan Gooley has written a few books that are packed with ways to navigate nature in all weather types and seasons. The Lost Art of Reading Nature's Signs is a great resource in more ways than one. If your child really loved learning about the clouds, Gooley’s book can help you know what to look for in the clouds to predict weather events. Though this is a difficult practice and one that requires a lot of repetition in order to master its teachings, it can also be simplified for children. Whether you are trying to locate the eastern sky without a compass, looking to navigate using constellations of the stars, or observing the ways trees and plants have a natural tendency to grow towards the sun, this book is full of great things to study in the natural world, in any weather. As an outdoor educator who has created programs with the slogan, “Rain or shine!” I often kick myself for being so optimistic. This is especially true if it rains for a week straight, and I’ve told all my administrators and parents, “So much learning can happen in the rain!” Though that might be true, being soaking wet all day can get old fast. There is a difference between learning in the rain and enduring a miserable soaking wet lesson just to make a point. I’ve learned not to force an outdoor activity when it’s pouring and be sure that everyone has the right gear. Don’t let a child say, “I don’t need a raincoat”; make them put one on. Once everyone is geared up and prepared, there’s a lot that can be studied. If you’re near a waterway, try to find all the places where water pours into that waterway. It can be a stream, a creek, or a river. Check out this blog I wrote about "Finding new waterways and hidden creeks" for a more in-depth look. Another one I wrote about "Following the water" shows how outdoor activities can connect with the local watershed and some fun tours of the neighborhood. My suggestion would be to start small and find a nearby stream or creek in a public space that you can observe in rain. Hiking in Rock Creek Park during a shower will certainly reveal water in new spaces, but any park with a water source will do. 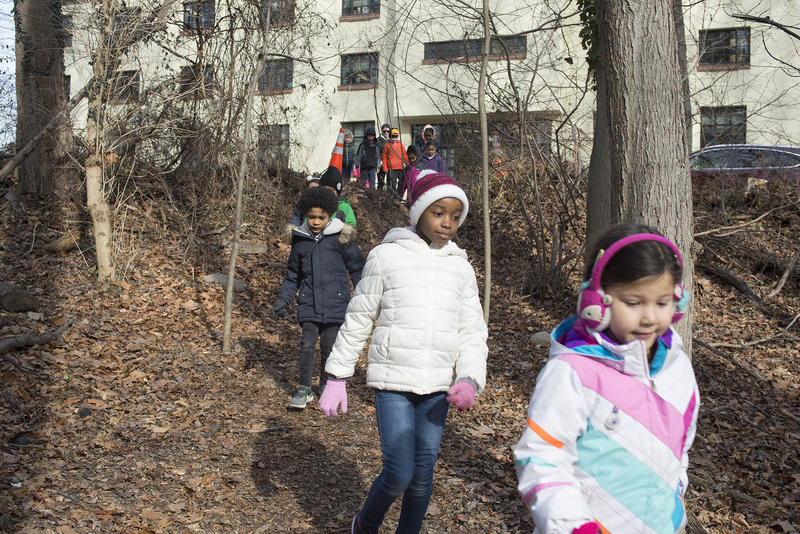 If your child really takes to this and enjoys the study of local creeks, considering digging deeper and getting involved with the Rock Creek Conservancy and their Adopt a Stream Program, or the Save Our Streams Creek Freak program. On a really windy day, a lot of things can be happening outside. I’ve gone out with a group after discussing the science behind wind speed and wind generation and challenged my students to a competition to see who can harness the wind for the longest period of time. All we brought with us were plastic bags, like the ones you get at the grocery store. Students were tasked with finding the best place to secure their bag in order to keep it inflated for the longest period of time. This activity can bring up discussion points like wind gusts or sustained wind. It can also lead to a great STEAM activity like building a kite or something that can fly in the wind. PBS provides a few excellent kite creation activities for you to try with your child indoors or out! There are all kinds of great small solar panels on the market now-a-days. Take a look at what REI has to offer. This can be an easy way, especially on cloudy days, to see the true workings of a solar panel. Bring a phone or small portable device that has a low charge and see if your child can find the best place to put the solar panel to charge it. Ask questions: What happens when the sun is covered by the clouds? Where is the best place to put the panel? How does this solar panel work? Take your exploration to the next step and measure how long it takes to fully charge a device in the sun and how long it takes to charge a device in the house. Take that to the next level by purchasing a solar panel kit for your child to see the technology behind these small solar panels. When it’s cold, giving children the opportunity to warm themselves by a fire can be very rewarding. Making a fire seems to be something that we no longer do unless we’re camping. To this day, my dad takes pride in his ability to warm up the living room with a roaring fire in the wood stove (even though the house now has central air.) Fire-making is a real skill, and it gives children confidence, builds self-esteem, and actually develops the use of safety skills like no other activity can. You don’t need a bow-drill or flint and steel. Just bring a pack of matches out to a campfire area, an outdoor grill, or beach area. Teach your child how to light a match, gather tinder, keep a close eye, and maintain the fire. Smokey the Bear has always been here to help. Take a look at some fire building tips from this resource. Snow and Ice can be a fascinating thing for younger children. I would recommend dressing for the weather and going out on an ice hunt in the natural world. This should be done at a time when you know there has been a freeze, but no snow or precipitation. Try to find the ice. Ask your child questions: How cold does it need to be for there to be ice? or What made ice form here and not here? For more wintry ideas, check out my earlier post, "Simple Outdoor Activities to Do With Children in Winter." Once you’ve done a little exploring and have sparked your child’s winter time curiosities, warm up inside and try some of these great winter time activities provided by Lemon Lime Adventures and Little Bins for Little Hands. These education bloggers have created an excellent list of fun, winter-time, STEM-related activities for your little ones to explore further what they have discovered outdoors. There are all sorts of weather-related activities out there that can spark interest in your child. If you’ve exhausted my list, take a look at 25 Fun Weather Activities and Crafts to find an activity that you think is manageable and see where it goes. Good luck!